We did our part for the neighborhood—we rebuilt, and we rebuilt quickly; I worked on a committee that applied for a revitalization grant for our shopping area; we exchanged contractors' names with everyone we knew and met—but we left New Orleans. Dad indulges my attempt to save the fridge, but Drosophila and mold thwarted me. Abandoned her, most New Orleaneans would say. A few friends and co-workers are still angry that we left. I don't defend our choice. It was the worst decision of my life and of my husband's life. Almost everything I've written since has a theme of loss, recovery, and resiliance. Feelings of estrangement and yearning permeate our lives, a homesickness for which the cure—moving back home—seems far away. Ten years after the flood that changed millions of people, writers and others are telling their stories. 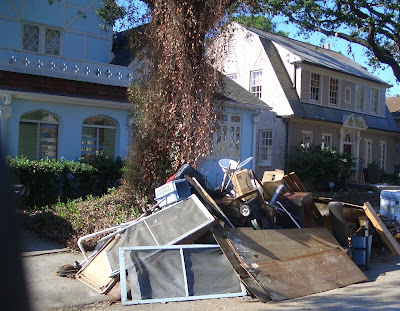 "A Letter From New Orleans Five Years Later"
Our ruined belongings piled at the curb, some unidentifiable. Warning: I haven't read any of these (although I did order some), so I don't know their quality. 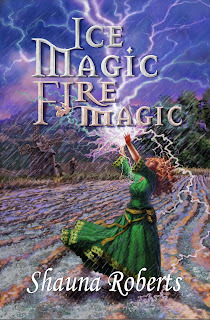 One last reminder—I'll be signing Ice Magic, Fire Magic at Mysterious Galaxy Books in San Diego today from 12 to 3 pm. 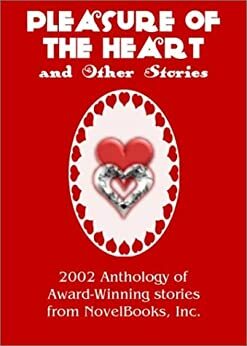 The tentative list of local authors signing today is Better Hero Army, Ethan Howard, Joshua Rutherford, Abigal Borders, Shauna Roberts, Vic Warren, Marie Andreas, Ona Russell, Paula Margulies, Kristen Elise, Cynthia Diamond, Jan St. Louis, Selena Jones, Rachel Marks, Lynne Kennedy, and Teri MacIntosh. Most or all publish with small publishers and/or are indie authors. and it specializes in science fiction, fantasy, horror, and mystery. (Yum!) It's a little tricky to find the first time, so drive around the shopping center and look for the storefront at right. It faces the back row of stores. Occasionally, another kind of book sneaks in to the store. Last time I was there, I bought a historical novel . . . although it was a rather strange novel that I think I need to read again. (John the Pupil by David Flusfeder, if anyone's curious.) Anyway, the store is worth driving an hour or two to check out if you like sf/f/h or mystery. Today's an especially good day to go because there'll be refreshments at the author event. More info on the signing at http://www.mystgalaxy.com/event/local-author-meet-greet-0815. 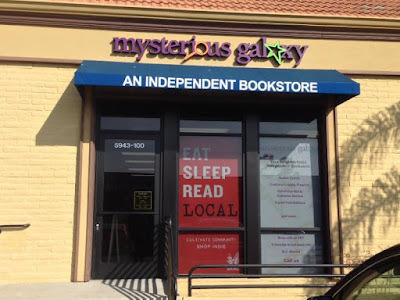 Although my fantasy novel Ice Magic, Fire Magic is not yet officially out in paperback yet, I'll be signing copies Saturday at Mysterious Galaxy Bookstore in San Diego from 12 to 3 pm. There will be a dozen other local indie and small-press authors also signing. So if you like sf, fantasy, or mystery, Mysterious Galaxy is the place to be on Saturday afternoon. I love this cover by Tom Vandenberg! Here's a list of the authors and their books: http://www.mystgalaxy.com/event/local-author-meet-greet-0815. I'm hoping to get there early to check out the books because some look quite interesting. If you don't know where Mysterious Galaxy is, you should. It's the best place to find science fiction, fantasy, horror, and mystery in southern California. They have booksignings often, so it's worth a trip. How far a trip? It's at 5943 Balboa Avenue, Suite #100, San Diego, CA 92111. Find a map and directions at http://www.mystgalaxy.com/Store-Information. If you can't make it, don't worry. 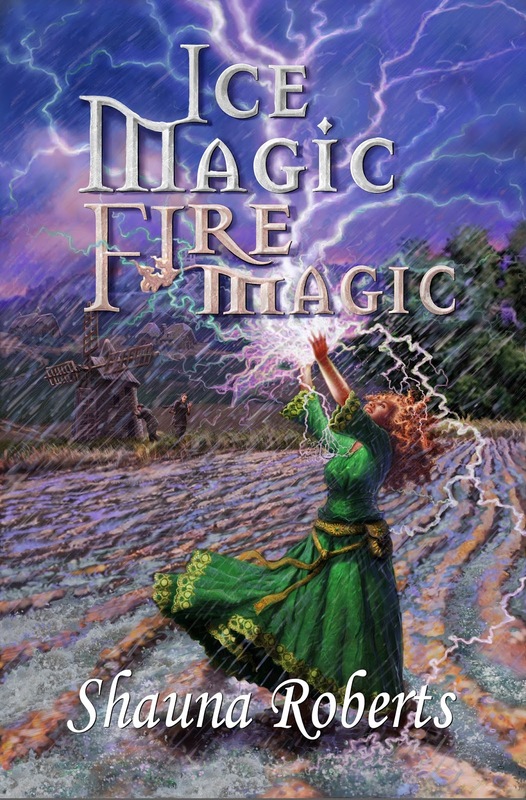 The Kindle ebook of Ice Magic, Fire Magic is already available at http://www.amazon.com/Ice-Magic-Fire-Shauna-Roberts-ebook/dp/B013IDBDG0/. You can order the other books from the signing directly from Mysterious Galaxy at http://www.mystgalaxy.com/event/local-author-meet-greet-0815. I'll be signing Ice Magic, Fire Magic. Stay tuned for date and time. I'll be signing Ice Magic, Fire Magic and Claimed by the Enemy at the Books on the Vine booth from noon to 1 pm. My novels will be available from 9 am to 3 pm, and I'll be stopping by the booth off and on during that time. There will be dozens of other vendors there selling holiday presents. I'll be signing Ice Magic, Fire Magic. Stay tuned for location, date, and time. I expect to be signing Ice Magic, Fire Magic. Stay tuned for date and time. 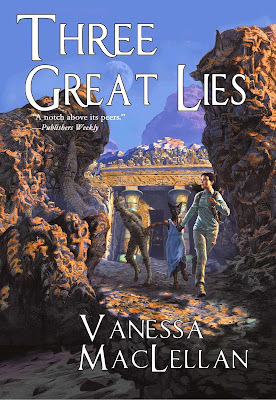 Vanessa MacLellan's’s first novel, the time-travel fantasy Three Great Lies (Hadley Rille Books), officially comes out August 6 but it is already available. Three Great Lies is the story of a half-human, half-elf woman and her struggle to find her place while, unbeknown to her, an ancient evil has awakened and plans to use her to destroy the world. Welcome, Vanessa, and congratulations on the publication of your first novel! Please tell us a little about yourself. I'm a tattooed, vegetarian, outdoorsy woman with one head in the clouds and the other firmly settled in my hiking boots. I'm an environmental engineer by day and author, runner, reader, gamer, and naturalist by night (and weekends). When did you start writing, and why? When I was a wee lass I'd make up stories to tell my mother while she was gardening. I think it started there. My favorite subject was Baggy Piggy, who had a curly Q tail that never ended (I knew this, because I drew him incessantly with pink crayons). I remember, before I could even write, 'writing' (aka doodling) on paper and then reading these works to my great grandmother. Storytelling is in my blood. I guess that's enough of a reason why. Though the fact that I enjoy it doesn't hurt. I have little people in my head (Doesn't every author?) who want me to explore their worlds, flesh out their personalities and goals, and give them something to do. I can't take all the credit; it's partially their fault. I write speculative fiction. Mainly fantasy, though I mix horror and magical realism in there. I write fantasy because fantasy is what first got me excited about reading. I remember my older sister, Audrey, handing me the first of the Piers Anthony "Xanth" novels, and I was astounded at these magical places, characters with magical talents, all of the magical beasts. Magic. Magic. Magic. I wanted that. To live there. Be special. Be something more than just human. I read as much fantasy after that as I could. Tolkien, Eddings, Pratchet, Weiss and Hickman, Duncan. You know the era and the authors. Their books are what fueled me as a young reader. I hope to fuel other readers too. Another reason I write is that joy comes from creation and imagination. Of speculating: What if? and expanding from that. I am the master of my own universe; what is not to like? What is your latest book? Any forthcoming books? My debut novel, Three Great Lies, releases August 6th. It's fantasy, with historical and literary trappings. It carries a bit of a “Finding My Place in Life” theme. Jeannette Walker, a modern scientist, ends up in ancient, mythological Egypt. Though she constantly casts doubt on the existence of such a world, she has to learn to live in it. While trying to save her mummy friend's soul from a wicked tomb-robbing ring, she realizes a few important things about life. What those are, well, you'll have to read the book! I have one complete manuscript for a dark fantasy I'm currently shopping out and am working on a modern superhero series. There's always something I'm working on. Tell us a little about the world of Three Great Lies. To Jeannette it's, of course, a total shock. There are people about in public naked, and jackals speak. A mummy—a desiccated, lumbering thing—chases her through the crowded streets, accusing her of stealing his ba! It's not necessarily a friendly place, but people are people, and even Jeannette is able to find friends in ways she never expected. Introduce us to some of your characters. What do you like about them? Jeannette Walker is my protagonist. She's in her mid-twenties, a scientists with a jilted past. She still holds the hurt from a past betrayal and has learned to trust nobody and nothing. I love her voice and her mind-chatter. And she's got a good heart that struggles to show through her armor. Abayomi is the dead man walking, a reanimated mummy who seeks his lost ba container so he can continue on to the afterlife. 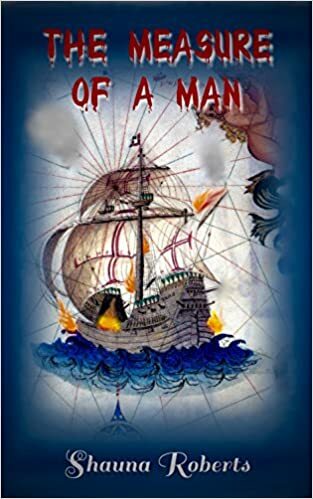 He's a perfect citizen who knows his place in the world and doesn't seek to unbalance tradition. . . . until his friends are endangered; then his loyalty shines like a beacon. True best-friend material! Sanura is the young daughter of Bast, cast out from her litter. She's lost and alone, and Jeannette saves her—saves her!—and she'll never forget such gifts. Sanura, like most young people, is soul-searching, trying to found out exactly why she's been cast away and what her purpose and place is in life. Her journey is one everyone can connect with. She's the spirit of the story. What fun fact would you like your readers to know about Three Great Lies? A major aspect of the book (the stray-dog theme) sprang to life at an agility dog show. The midsummer day was baking hot, and I had parked myself under a tree for the next show. A Jack Russell Terrier was looking at me with that intelligent tongue-lolling smile terriers have. Honestly, the dog was smiling. And that was the original start of the novel: "The dog was smiling at her." It's since changed, but that line and scene are still in there, the theme planted throughout the novel. The story just unfolded from that one dog's smile. Any challenges with getting Three Great Lies to where it is today? In 2008, I wrote my fifth NaNoWriMo novel. That was Three Great Lies. It was titled simply Egypt back then. It was a 50,000-word rough draft. Then I added extra plot threads and themes, and it topped out at 140,000 words. That's quite an addition! Then there were years and years of critiquing and editing. Now for the rough stuff. As I was due my edits, my publisher had a stroke. (Though he insists he was abducted by aliens to an alternate universe.) It was terrible; we weren't sure whether he would make it. The entire press huddled together in worry and anticipation. I was wavering between feeling devastated for my publisher's situation and worrying about the state of my book (and feeling so so guilty for that). 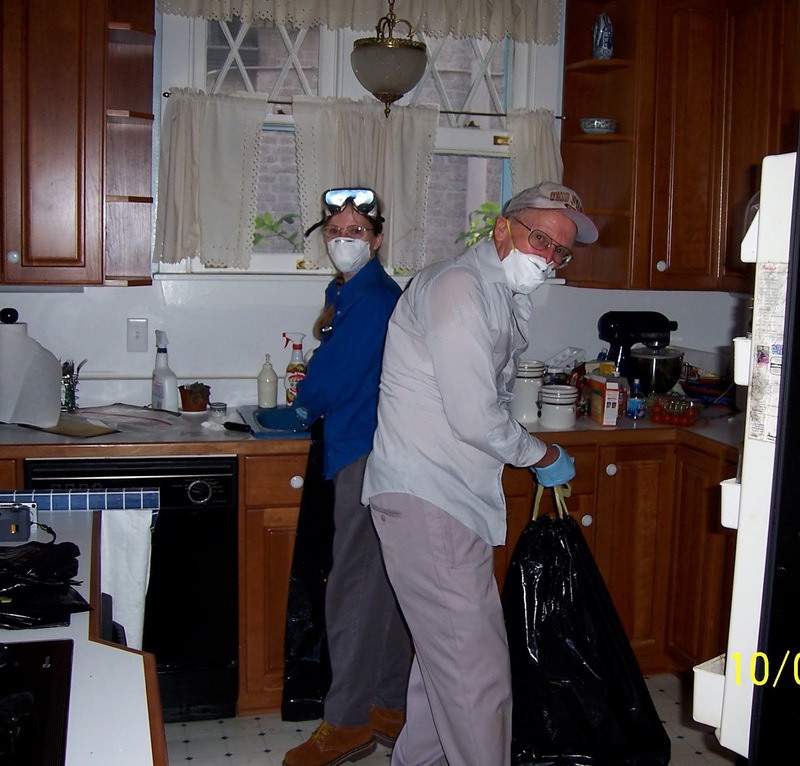 But he did pull through and has worked tirelessly on my novel, by my side every step of the way. First and foremost, Three Great Lies was a “pantser” book. I didn't have an outline. I wrote forward from the smiling dog on guts and intentions. I had this idea of where I wanted to go, with no map on how to get there. Now, I am an outliner. I think the process, for me, would have gone so much faster if I'd had a more solid idea of the substance of the story. As it was, lots and lots and lots of editing and rewriting were necessary to make this book shine. Another thing I've learned: Do not work heavily on writing in the summer. I like to play outside too much, and I feel guilty if I don't write. Now, I just hold up my hands and let it all go. Summer, for me, is play time. No guilt for taking some time off writing. Because we're our worst guilt-trippers. 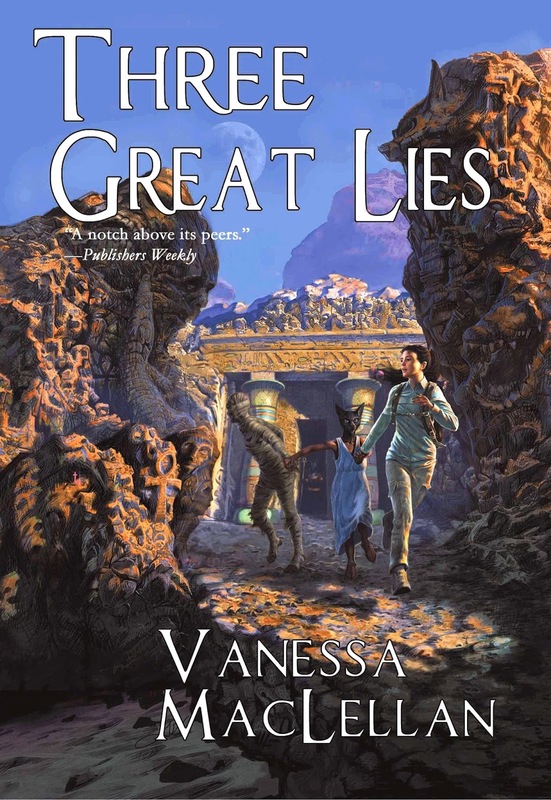 You can learn more about Vanessa and Three Great Lies by visiting her Website at http://www.vanmaclellan.com/. Her book is available from Amazon.com in Kindle and trade paperback versions.